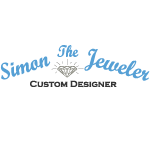 Simon the Jeweler has over 30 years of experience as a custom designer. That background provides us with the versatile skill and unquestionable ability to satisfy a wide range of needs. We are the one-stop shop for all your jewelry needs. All work is done on the premises by Simon, so you can always count on the finest workmanship and highest quality. Plus, we always treat our clients with honesty and respect, because your satisfaction is the measure of our success!